The 2017 Honda Ridgeline is in stock at Brilliance Honda of Crystal Lake, and the RTS offers a few more important features compared to the base model, all while maintaining a low price. Find out more about the current Ridgeline RTS here at Brilliance Honda, conveniently located near Elgin and Crystal Lake! 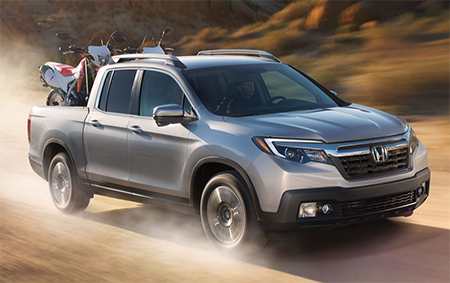 The Ridgeline RTS is powered by a 3.5L direct-injection V6 engine that produces 280 hp and 262 lb-ft of torque. The RTS gets front wheel drive, and all-wheel drive is available as an option. In EPA estimates, the Ridgeline is capable of up to 19 mpg city/26 mpg highway/22 mpg when combined with front wheel drive and a standard six-speed automatic transmission*, while the all-wheel drive version with standard six-speed automatic transmission achieves up to 18 mpg city/25 mpg highway/21 mpg combined*. When it comes to towing, the all-wheel drive model of the Ridgeline is rated at up to 5,000 pounds when equipped properly. The RTS includes many of the same upscale features offered in the RT, such as automatic headlamps, Bluetooth phone and audio connectivity, 5-inch infotainment display, and more. The Honda Ridgeline RTS comes standard with traction and stability control and anti-lock brakes. It also comes with a rearview camera for ease of parking and reversing. As if that wasn’t enough, it also features a tire pressure monitoring system. The Honda Ridgeline RTS is now available here at Brilliance Honda on 680 W. Terra Cotta Ave. in Crystal Lake, IL. We’re happy to help you find the Ridgeline model that’s best for your budget and your needs, so visit us today!